A late 18th-century 18-karat gold box depicting a Greco-Roman god, elaborate palmette, and linear engine-turned details. 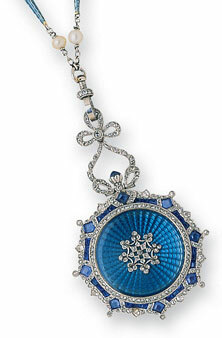 Precision engine-turned Belle Epoque guilloche enamel on a sapphire and diamond pendant watch, circa 1900. 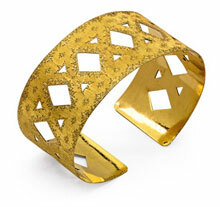 18-karat gold Buccellati bracelet engraved with stars and scrolling floral garlands on a hatched background. For untold eons, human being have had the primal urge to make a visible mark on their surroundings and possessions. Imagine the sense of wonderment and surprise at the revelation when primitive man first noticed a set of footprints left behind in the sand or that first line boldly sketched in the dirt with a sharp stick, one of the simplest, most rudimentary tools. Think of the instinctive behavior of a courting couple carving their initials in the bark of a tree, outlined romantically with a heart. Making impressions on jewellery has progressed from crude to specialized engraving tools for creating chased, calligraphic, and engine-tuned work. More modern technical wizardry and sophisticated mechanization of ornamental turning lathes, such as the rose-engine geometric or straight-line type, make possible the intricate patterns in guilloche work. 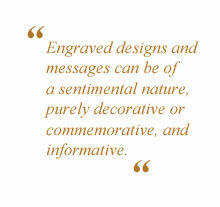 Engraved designs and messages can be of a sentimental nature, purely decorative or commemorative, and informative. Historically, jewellery artisans as far back as the 1600s, known as ‚Äògravers‚Äô, completed their design using hand-held tools-burins, which are similar to awls, as well as variants of hammers and chisels, punches, lathes, and dies (as in tool and die). These job-specific tools were used for impressing, embossing, or scratching and etching a pattern into precious metals such as gold, silver, and platinum, along with rock crystal, glass and hardstones like lapis lazuli, carnelian, and agates. Each tool was designed with different end points, which in the hands and imagination of a skilled engraver, artistically contributed to specific pictures, patterns, and textures in the finished item. Traditionally, minute bits of the ground material are chiseled away or struck from behind, creating high and low relief. Nowadays, computer-guided machinery trumps a hand-held burin or hand-turned lathe, ushering in a revolutionary change in technology. Your customers who are left-brain-focused will appreciate having these sorts of details pointed out to them and intricate background information will appeal to their logical, analytical side when considering a suitable purchase from your collection. A perfect example of the art of guilloche is the work of the Faberge workmasters from the late 1800‚Äôs, who used engine-turned lathes to decorate the background of translucent enamel masterpieces, mechanically etching repetitive patterns of simple, though non-concentric circles that when multiplied become more complex and colourful with the addition of glass firings. Pendant watches from the Belle Epoque era are great example of this technique. Sometimes lacking the enamel component, cigarette lighters and pen barrels have been decorated with cross-hatching motifs. Lately, one of the newest applications for engraving has a more practical consideration, namely modern laser engraving on a diamond girdle to provide country of origin authentication. Changes in style occurred through every ear, from 15th-Century Renaissance to the elaborate baroque and rococo periods in the centuries that followed. French ornamentation, streamlined Art Deco, tendrilled art nouveau, and avant-garde German, English, and American all jostled in turn as the preferred modes and favoured motifs. Two of the most recognizable classical jewellery patterns often seen on brooches, double-clips, pendants, and lapel watches were the continuous linear fretworks of the angular Greek key and Art Deco ziggurat-stepped patterns, each equally elegant in their repetitive and spare simplicity. Neo-classic snuff boxes from the 1770s, such as those by Peirre-Francois Drais, are edged in popular friezes of palmettes, coiled waves and scrolls known as gadroons, assorted representations of botanical foliage, and especially the oh-so-familiar acanthus leaf. Celtic knots, thistles, the Prince of Wales‚Äô triple feathers, and the English Rose were frequently seen on items originating in the British Isles. Festoons of ribbons and floral garlands, along with oak leaf motifs and rows of fish fins, were interspersed with grape vines and leaves and either botanically realistic or stylized flora and foliage. Instead of less is more, the more over-the-top, the better. 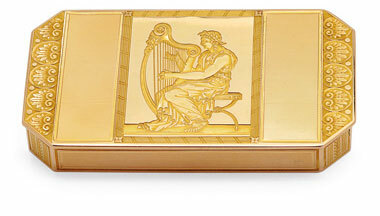 Motifs from ancient Greece, Rome, and Egypt with their respective pantheons of gods, goddesses, and all manner of mythological figures and classical musical instruments like the lyre, can be found embellishing snuff boxes, powder puff compacts, and minaudieres. These were often framed within cartouches of laurel leaf wreaths and bordered by multiple panels of various cross-hatched patterns. The combinations and permutations are endless. For the timepiece enthusiast, it‚Äôs easy to admire the geometric engine-turned patterns common on the dials of high-end wristwatches from Breguet, Rolex, and Vacheron Constantin. Don‚Äôt forget the interiors are just as important and the term ‚Äòdamaskeening‚Äô, originating from the city of Damascus, refers to the ornately engraved movements of antique pocket and wristwatches. If buyers are interested in Victoriana, they might be keen on ‚ÄòMemento mori‚Äô or mourning jewellery, which almost always contains a date to denote birth and death and often a sentence alluding to the ‚Äòfond remembrance‚Äô of the departed loved one. Carved gems, also known as glyptics, have decorative elements written in reverse with mirror-writing inscriptions so that when a wax impression was made and affixed to paper, the commonly used in intaglio signet rings or decorative watch fob seals incised with heraldic family crests or monogrammed initials cut into the flat back of a hardstone. Major international jewellers often incorporate letters, numbers, specific logos, or dates significant to the company‚Äôs history into the metal. For example, Bulgari‚Äôs bold block print font on its ‚ÄúBulgari Bulgari‚Äù collection is incised twice for maximum impact on the metal frame surrounding a round onyx plaque. Similary, Tiffnay & Co., commemorateds the year of the company‚Äôs founding with its ‚Äò1837‚Äô collection. When life gives you lemons, make lemonade. The same holds true in estate jewellery, where any perceived negative can be gently tweaked towards the positive. Think of previously inscribed wedding rings with their hopeful romantic bon mots delivered in flowing calligraphy on the shanks‚Äô interior indicating the original giver‚Äôs unwavering love and affection for the recipient. Well, sadly, not every fairytale has a happy ending and any now inappropriate message or date can be polished out. Your resale buyer has various fonts and scripts, serifs or sans-serifs, to choose from to convey a personalized message. The client is limited more by space than imagination. Sweetening the lemonade takes a bit more effort when the depth of engraving makes eradication difficult. Consider flatware already monogrammed with initials that at first glance don‚Äôt seem relevant to the potential new owner. For example, the Smith‚Äôs new cutlery marked with the initial ‚ÄòD‚Äô could stand for ‚Äòdinner‚Äô or ‚Äòdinning‚Äô or ‚Äòdelicious‚Äô. Here‚Äôs where a sense of humour and willingness to compromise are essential. From that very first impermanent and fleeting stick drawing washed away by waves on a beach to the permanent memory etched into the shank of a wedding band, these diverse applications of engravings and scripted messages are a testament to the artistry, skill, and evolution of the master engraver. Helping to broaden your customer‚Äôs scope of appreciation for engraving can bring benefits to each of you, and in the process, give the left and right sides of our brain a workout.